Barça league leaders again after beating Villarreal 2-0. 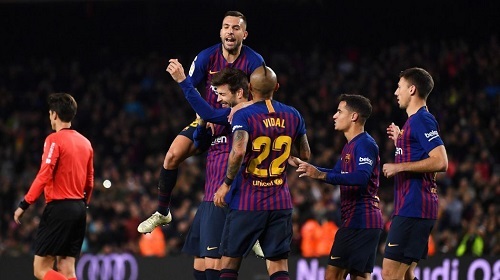 FC Barcelona claimed the top spot in the league standings after defeating Villarreal 2-0 with goals courtesy of Piqué and starlet Carles Aleñá. Sevilla’s draw to Alavés meant that the Blaugrana were league leaders again after the 14th round of games with 28 points with Sevilla behind them by a mere point. Piqué gave the home side the lead when he headed in Dembélé’s cross in the 35th minute. Substitute Aleñá scored the insurance goal in the 86th minute after racing on to an excellent through ball from Messi before showing remarkable poise with a superb composed finish by the 20-year-old. Perhaps we will see more of Aleñá on Wednesday when Barça host Cultural Leonesa in the second leg of their Copa del Rey clash before Barça face Espanyol on Sunday in the Derbi barceloní. FC Barcelona: Ter Stegen; Semedo, Piqué, Lenglet, Jordi Alba; Busquets, Rakitic, Arturo Vidal (Aleñá, min. 64); Dembélé, Coutinho (Malcom, min. 79) & Messi. Villarreal CF: Asenjo; Mario Gaspar (c), Álvaro, Victor Ruiz, Pedraza; Trigueros (Bacca, min. 61), Cáseres; Chukwueze, Fornals, Cazorla (Raba, min. 87) & Gerard Moreno (Ekambi, min.78). Goals: 1-0, Piqué (min. 35); 2-0, Aleñá (min. 86). Cautions: Víctor Ruiz (min. 11), Lenglet (min. 17), Álvaro (min. 26), Jordi Alba (63′), Fornals (min. 89) & Pedraza (min. 90). Previous PostBarça defeat PSV 2-1 and win Champions League group. Next PostBarça advance to Copa del Rey Round of 16 after eliminating Cultural Leonesa.